Baum Squad: The Baum Family Blog: Panic. And Progress. I had an appointment with the doctor today, and I'm sure that it will shock no one when I admit that it put me into a complete panic this morning. We got an ultrasound at the appointment to determine just how big this whale/elephant baby really is (more to come on that in tomorrow's post), and I started to worry about all of the things that we haven't done that I would like to do before he gets here. You know, big things like light a fire under someone so that our crib gets here before 2015; get a mattress for said crib as well as various other baby accessories; find a dresser for the nursery; put the nursery together in general; go through all of Lilly's baby stuff and try to get organized; do a ton of laundry. And then smaller things, like shop for a few things we still need; pack a hospital bag. Oh yes, and did I mention that Lilly's second birthday is next week and I am not the least bit prepared? It never ends. I really did not intend to procrastinate on any of this (I know what you're thinking, I've known it was coming for 8 months now), it's just that life has been so unbelievably busy that when we've had any rare free time I've wanted to savor it and hang out with my sweet family instead of working on things and preparing. That and I'm exhausted all of the time and find it hard to want to do anything except lay around. I texted Dan this morning, "Seriously I am the definition of dragging @$$ today. I am SO exhausted and I'm not sure why because I got my first decent night's sleep in what seems like months." 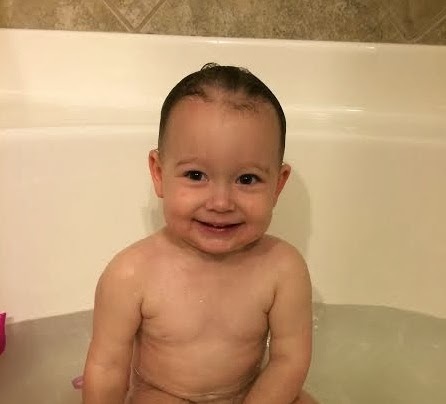 Sucking the life slap out of me, my little whale baby is! 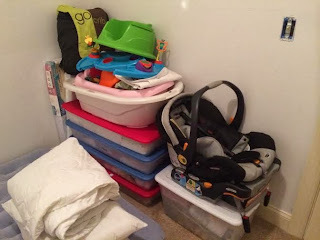 I put together a list this evening of everything that I'd like to get done before baby's arrival. To say the list is long would be severely understating, but we actually made some progress tonight and I'm feeling slightly less panicked. We still have a LONG way to go, but I'm feeling accomplished nonetheless. And exhausted, too (shocker). 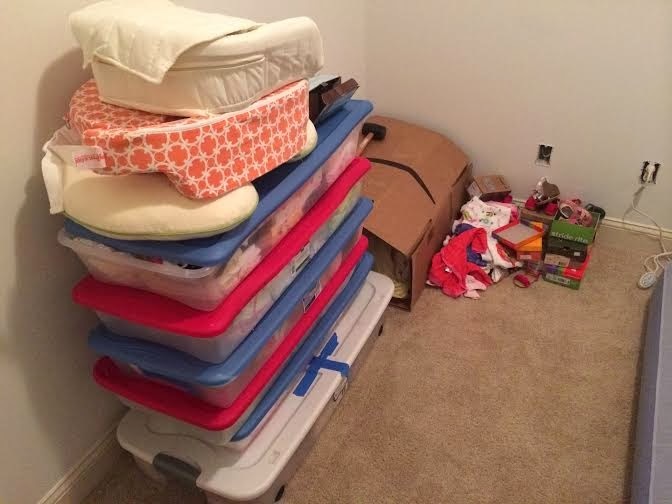 Tonight, we (and by "we" I mean "Dan") took all of our baby crap out of the attic and moved it into baby's room. Dan has work events several nights this week, so I can at least start going through clothes and other things a little at a time on those nights after I put L to bed to determine what we can re-use; what I want to keep; what I want to donate, consign, etc. New stuff to go through and organize! Like I said, it may not look like we accomplished much but I am feeling good about our progress. We also started to tackle playroom organization. We have a LONG way to go in that room, but it has also come a long way from where we started, so I'm feeling good about it. The sooner we get everything where we want it, the sooner we can start to help Lilly with the concept of "everything has a place" (and the sooner the rest of my house looks less cluttered, double bonus). The attic access is in Lilly's room, and part of the reason we haven't started on any of this before now is because we always seem to forget about it until she's sleeping. She had a blast playing in the bottom of her closet with a basket of Easter eggs while we were getting stuff out of the attic tonight, though. Seriously, if I had known a basket of Easter eggs in a closet would have entertained her for such a long period of time I would have let her play in there WAY sooner. All that to say...there is a reason I still haven't gotten to the last Christmas post, and all of the above pretty much sums it up. :-) Some day (hopefully before the end of January)! Hope you had a wonderful (and productive!) Monday as well! T-minus four weeks from tomorrow (hopefully less!) we will be a family of four. Eek! Eeek! Crazy exciting… are you sure you're going o make it 4 weeks?! !